This painting called Grandfather’s House (on view at the Phoenix Art Museum) was indeed Phil’s grandfather’s house. 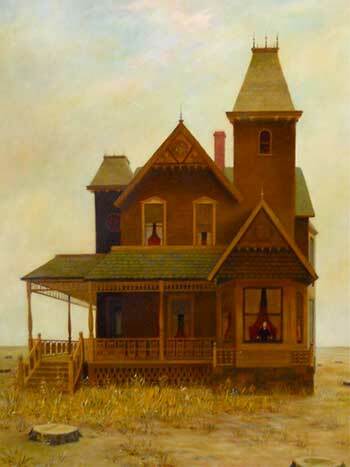 The house in the painting however is not in Jackson, Michigan but in an arid wasteland of sorts. Old fashioned buildings and architecture looms large in Curtis paintings. In many of Phil’s paintings you’ll see the interior of what looks like an ornate Victorian home from the doorways to the furniture. Another repeated feature is ornate staircases. The people wear Victorian era clothes. It’s their expression or lack of one that makes you wonder where they really are. Sadly, this house no longer exists in Jackson but I still want to find out where it used to be. Library here I come!